146 records – page 1 of 3. 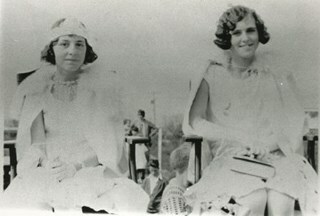 Photograph of Burnaby May Queen Margaret Henderson sitting on a platform on a stage with the out-going May Queen, Ruth Bearn. Two Burnaby officials are standing on the stage. The Queen's suite is sitting on the stage (Flora McCallum is sitting third from the left and has long culry hair) with the younger ones sitting on either side of the steps. Photograph of the stage at the first May Day celebration in Burnaby in 1925. There are flower girls lined up along the steps up to the stage with a carpet running along the centre of the steps. The photographer is speculated to be Stride studio, because of the similarities with other 1925 Burnaby May Day photographs by Stride studio. Photograph of May Queen Miss Ruth Bearn in her crown of flowers, and Miss Burnaby, Miss Agnes Gilmour, sitting on chairs on a stage at the First May Day celebration in Burnaby in 1925. Another girl in the suite and some men can be seen sitting on the stage as well. Crowds gathered to watch the cermony are also visible. The photographer is speculated to be Stride studio, because of the similarities with other 1925 Burnaby May Day photographs by Stride studio. inscribed in the original negative, and printed on the photograph, l.l. "Burnaby's First May Day 1925", b. "#9", l.r. "Stride Photo"
Photograph of the offical gathering of the May Queen suite at the first May Day celebration in Burnaby in 1925. Men in suits and uniforms, are standing with the suite, likely from the municipality. There are chairs on the stage, however, people are standing. Flower girls are sitting on the steps to the stage. Crowds gathered to watch the cermony are also visible. Photograph of the crowned May Queen giving her speech at the first May Day celebration in Burnaby in 1925. The suite is gathered on a platform, with men in suits and uniforms, and flower girls sitting on the edge of the stage by the steps. There are chairs on the stage; however, people are standing. Crowds gathered to watch the ceremony are also visible. There are mountains visible in the background. Inscribed in the original negative and printed on the photograph, bottom front "#10 / Burnaby's First May Day 1925 / Stride Photo." Photograph of the official gathering of the May Queen suite at the first May Day celebration in Burnaby in 1925. 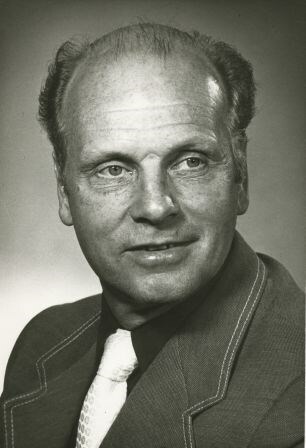 The suite is standing with men in suits and uniforms, likely from the municipality. There are chairs on the stage; however, people are standing. Flower girls are sitting on the steps to the stage. Crowds gathered to watch the ceremony are also visible. Inscribed in the original negative and printed on the photograph, bottom front: "Burnaby's First May Day 1925 / #9 / Stride Photo." Photograph of the May Queen Miss Ruth Bearn in her crown of flowers, and Miss Burnaby, Miss Agnes Gilmour, sitting on chairs on a stage at the First May Day celebration in Burnaby in 1925. Another girl in the suite and some men can be seen sitting on the stage as well. Crowds gathered to watch the ceremony are also visible. Inscribed in the original negative and printed on the photograph backwards, bottom front: "Burnaby's First May Day 1925 / #6 / Stride Photo." 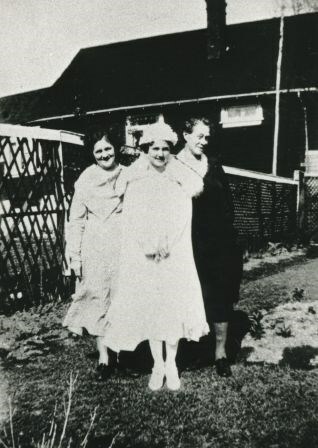 An annotation in pencil on the back of the photo reads: "Different source"
Photograph of the May Queen, Miss Ruth Bearn, standing on a sidewalk, beside a house. She is wearing a fur lined robe, with long pearl necklace, and has a flower basket by her feet. 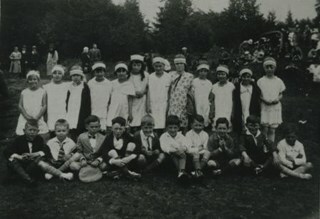 Inscribed in the original negative and printed on the photograph, bottom front: "#17 / Burnaby's First May Day 1925 / Stride Photo." An annotation on the back of the photograph reads: "May Queen Ruth Bearn." Photograph of the May Queen, Miss Ruth Bearn in her crown of flowers, and Miss Burnaby, Miss Agnes Gilmour, sitting on chairs on a stage at the First May Day celebration in Burnaby in 1925. Another girl in the suite and some men can be seen sitting on the stage as well. Crowds gathered to watch the cermony are also visible. Inscribed in the original negative and printed on the photograph, bottom front: "#6. / Burnaby's First May Day 1925 / Stride Photo." 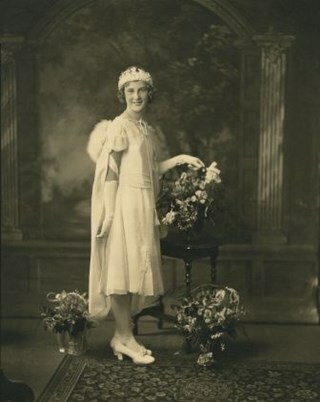 An annotation on the back of the photograph reads, "May Queen Ruth Bearn / Miss Burnaby Agnes Gilmour." Photograph of the parade of May Queen Suite at the May Day celebration in New Westminster in 1934. Leading the parade are flower girls, and following them are the girls in the suite, each escorted by a man in a suit. In the background, there are crowds of people gathered to watch the parade. Inscribed in the negative and printed on the photograph, bottom front "The 65th May Day Celebration / New Westminster, B.C., May 11th, 1934 / Stride Studio Photos / 6." Photograph of a May Day ceremony at Robert Burnaby Park taken from a distance. 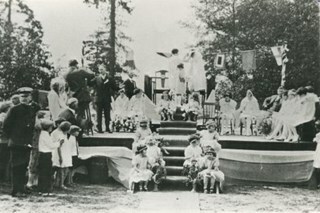 The May Queen and her suite are on the platform set up by the lake, surrounded by a large crowd (this was the first year that May Day was celebrated at Burnaby Park). Photograph of the parade of the May Queen and the suite at Burnaby's May Day Celebration. Crowds are gathered to watch the parade and may poles have been set up on the field. 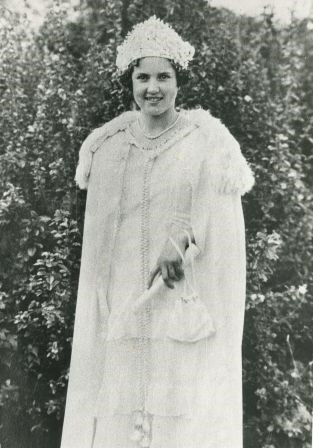 The first young woman in the line after the May Queen is Margaret Hall (later Philps) who was the May Queen in 1932 (she was filling in for 1933 May Queen who was sick). Inscribed in the negative and printed on recto of photograph: "MAY DAY CELEBRATION / BURNABY, B.C., MAY 26TH, 1934 / STRIDE STUDIOS PHOTO / 24"
Photograph of Margaret McCallum, Maid of Honour for the first Burnaby May Day standing in front of a large hedge with a basket of flowers at her feet and dressed for her roll as the May Queen’s Maid of Honour. 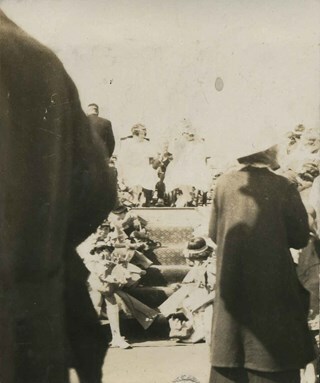 Photograph of what looks to be the crowning of a May Queen at at unidentified location. Item is an arrangement of sepia photographs mounted on black paper with handwritten text and decorative borders. The page documents "Princess Burnaby (Angnes Kilgour)" and "The First May Queen (Ruth Bearn - 1st Company Girl Guides)." Item is a sepia photograph mounted on black paper with handwritten text and decorative borders. 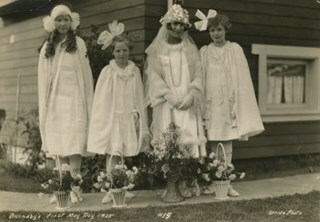 The page documents Burnaby's first May Queen and her Maids of Honour. 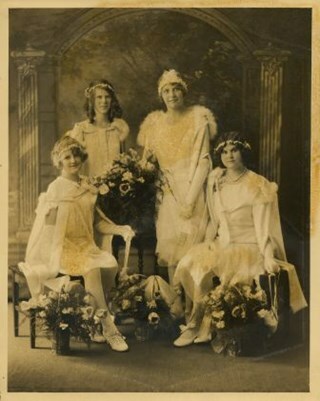 The photograph's caption reads, "+Margaret McCallum +Jessie Gungion +Ruth Bearn +Eileen Jacques+." Item is a sepia photograph mounted on black paper with handwritten text and decorative borders. The page documents Princess Burnaby and her Maids of Honour. The photograph's caption reads, "+Lois Lister +Nellie Mitchell +Agnes Kilgour +Lucretia Adair+." Item is an arrangement of sepia photographs mounted on black paper with handwritten text and decorative borders. The page documents the May Day procession. Photographs are titled, "The Royal Party" and "Arrival at the Grounds." Item is an arrangement of sepia photographs mounted on black paper with handwritten text and decorative borders. The page documents the May Queen and Princess Burnaby. Photographs are titled, "Their Majesties" and "The Royal Stand." Item is an arrangement of newspaper clippings mounted on black paper with handwritten text and decorative borders. The page documents the May Queen, Princess Burnaby and the Burnaby Scout's involvement in the May Day celebrations. Item is an arrangement of sepia photographs mounted on black paper with handwritten text and decorative borders. The page documents the May Day celebrations. Photographs are captioned, "The First School Teacher in Burnaby," "The Escorts," "Felix Penne (Francis Bursill)," and "After the Coronation." Photograph of the Valleyview Community Centre May day celebrations. The May Queen and her suite are seated with three men and a woman standing behind them. Identified are (back row, l to r) MLA Ernie Winch, unknown, Burnaby Reeve Geroge Morrison and unknown woman. The Valleyview Community Centre was located at 4050 Grandview-Douglas Highway (later renumbered and renamed 4949 Canada Way). 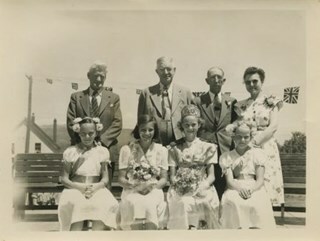 Photograph of the Valleyview Community Centre Fair, May Queen and Suite standing outside. One of them has a crown and two are carrying boquets of flowers. Photograph of the Valleyview Community Centre fair's May Queen dressed in white, wearing a crown and standing at a microphone on a decorated stage. Men and other girls are also on the stage. 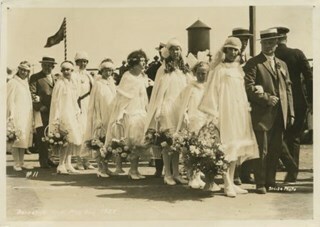 Photograph of a row of young women and girls dressed in white, wearing cloaks and carrying baskets of flowers at Burnaby's first May Day. A water tower is partially visible behind them. Annotation at bottom of photograph reads, "Burnaby's First May Day 1925 / #11 / Stride Photo"
Photograph of Burnaby's May Queen and her suite seated with flowers at a photographic studio. Photograph of Burnaby's May Queen standing in a photographic studio beside a three-legged stool that has been decorated with flowers. Stamp on cardboard mat photograph originally framed with read: "The Stride Studios, New Westminster, BC". Photograph removed from frame for conservation purposes; mat not retained. Photograph of Burnaby's May Queen standing with one of her attendants, as the rest of her suite sits, surrounded by flowers at a photographic studio. 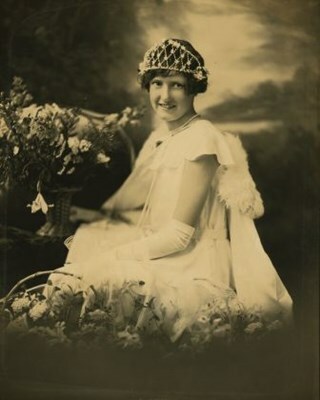 Photograph of Burnaby's May Queen seated in a photographic studio with flowers surrounding her. 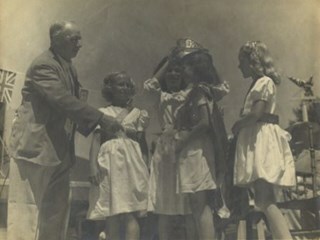 Photograph of the Valleyview May Queen being crowned. Standing on the stage are; Henry Hill, [unidentified], Helen Brown, [unidentified], and Mary Dobson. 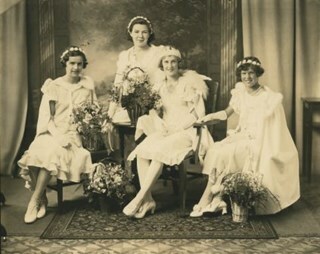 Photograph of the Burnaby May Queen and Princess Burnaby sitting with their suite at a photographic studio. Identified on the photograph's cardboard frame are; (back row, left to right) Jessie Gunzeon, A. Jacques, M. McCallum, Louise Lister, Lucretia Adair, and Nellie Mitchell. Seated, left to right: Ruth Bearn, "Burnaby May Queen 1925," and Agnes Kilgour, "Princess Burnaby 1925." 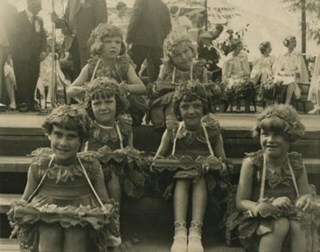 Photograph of May Day flower girls seated on the stairs of a stage at May Day celebrations. All are unidentified except the girl at the top left, Sheila Davy. The May Queen and court can be seen in the background. 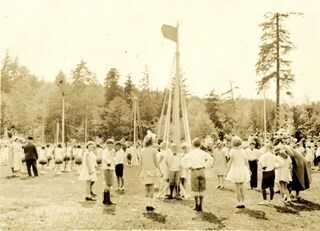 Photograph of Burnaby's first May Day in 1925. 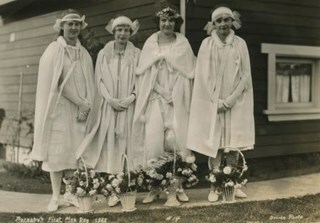 Four young women are wearing cloaks and standing with baskets of flowers. Two of the young women have been identified as Lucretia Adair and Louise Lister, but it is not clear which two they are. Printed at bottom left of photograph: "Burnaby's First May Day, 1925 / #14 / Stride Photo"
Annotation on back of photograph reads, "Lucretia Adair / Louise Lister"
Photograph of Burnaby's first May Day in 1925. 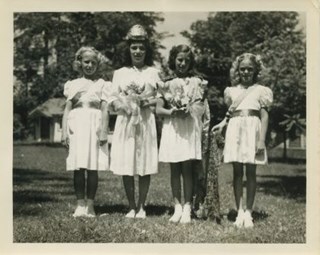 Four young women are wearing cloaks and standing with baskets of flowers. 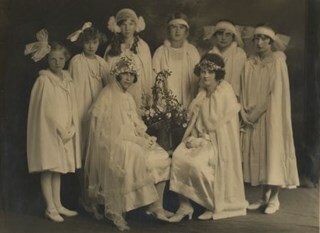 Ruth Bearn, the May Queen, is standing third from the left, with a crown on her head. Printed at bottom of photograph: "Burnaby's First May Day 1925 / #15 / Stride Photo"
Annotation on back of photograph reads, "Queen Ruth Bearn"
Photograph of the 1928 May Queen, Sylvia Murley standing in the center. On the right is Lottie Butchart, the other young woman is unidentified. Photograph of outgoing May Queen Sylvia Murley (later Sylvia Auvache) sitting with new queen, Winnifred Jeffery (daughter of Constable George Jeffery) at May Day celebrations in Central Park. 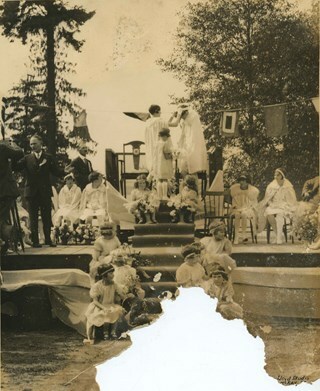 Photograph of the crowning of May Queen Sylvia Murley (later Sylvia Auvache) at Robert Burnaby Park. Photograph of May Day activities in Robert Burnaby Park. Identified: (5th from left) Ellen "Nellie" Fetherstonhaugh (she later changed her first name to Leta and later became Leta Arden), 10 years old, flower girl. Photograph of three generations of the Smedley family. 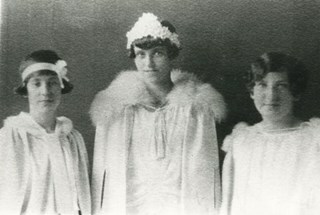 Left to right: Alice Smedley Hatt, Ada Hatt as the 1933 Burnaby May Queen, and Emily "Grandma" Smedley. Alice was the oldest daughter of Emily Smedley, and Ada was Alice's daughter. 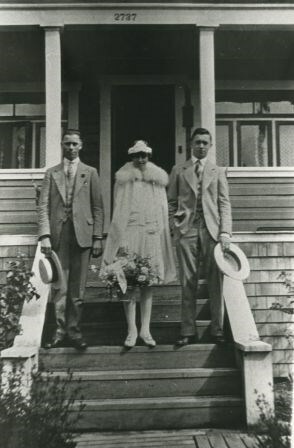 Photograph of Ada Hatt, Burnaby May Queen, at age 13. She was daughter of Alice Smedley Hatt, the oldest of Smedley girls. Photograph of a group of children at May day. 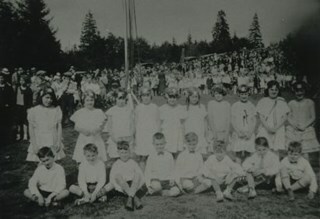 Boys are seated in the front row, and girls are standing in the back row, dressed in their Maypole dancing dresses during Burnaby May Day at Burnaby Park. 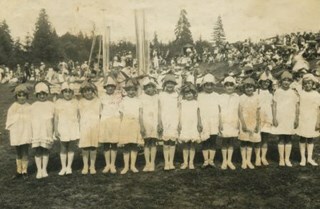 Photograph of two rows of Maypole dancers during Burnaby May Day at Burnaby Park. A large group of spectators is visible in the background. 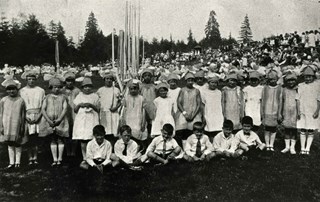 Photograph of the Kingsway West Maypole Dancers standing in a row with the Maypoles behind them on May Day, at Robert Burnaby Park. 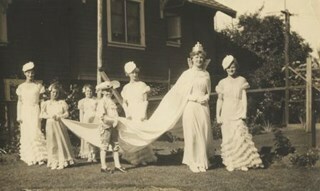 Photograph of the May Day Queen and her suite in full regalia standing in a garden. 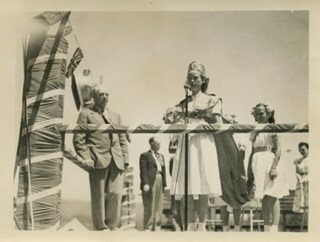 Photograph of the May Queen being crowned on stage. 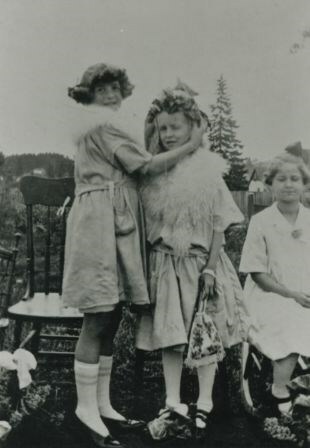 Photograph of Lillian Ward being crowned May Queen by Doreen Burton at a small neighbourhood celebration near the Burton home on 11th Avenue.